Satellites are all around us. Floating in the space there are more than 13000 pieces of metal streaming all kind of data. Our concept of space and time changed since we can base our day life on tools like google maps, gps and others satellite stuffs. There is a continuous stream of information in and out from our planet that define a new way to live the globe. New connections, old surveillance methods and a new geospacial territory are possible in order to get autonomy. In this sense satellites are a narrative platform where build all together different connections between people, a stronger way to empower local communities. All this information should be free cause free is the space: the last place still not privatized where all our data and dreams persist over time. 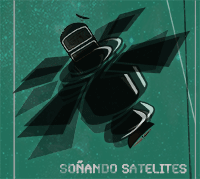 Soñando Satelites [Dreaming Satellites in Spanish] is a ritual of re-appropriation, a celebrations of the fact we are involved in the same data-space that could control bodies or change relations between entities. 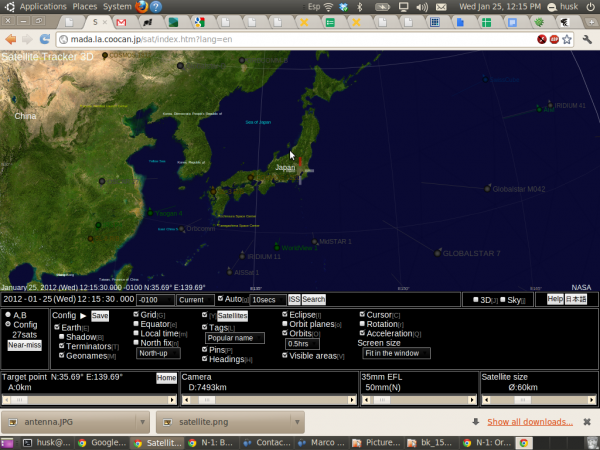 A real time satellite sound track that invite to dream and propose to look over our head as a land to explore and hack. It is a generative sound track connected to a realtime multi tracking satellites system called Gpredict. David Pello developped a patch# for the program to get object orbit calculation sent as OSC protocol. This feature was request# first time to Gpredict’s developer during interactivos?10 workshop from Alejandro Duque but just at Orbitando Satelites that patch has been made. This piece of software was the connection bridge between satellite domain and different [data] worlds. It lets extrapolate satellite data from original context in order to make it a creative prime material for something “completelly” different. Soñando Satelites has been made using “din – din is noise” at first, a free sound software by S. Jagannathan. By drawing Bezier curves is possible to sketch audio like in a vector paint software. Lately the recording was used as prime material inside a Puredata patch to add reverb, spazialization, wave distortion and interaction with satellite data. The patch used for that work was originally made by Alberto Zin# an modifyed by adding a wavedistorsion and a bitcrusher filter and was mixed with field recording of satellite communication done during the workshop. This recordings are real communication between an (italian) astronaut from ISS# and an italian radio amateur catched with an amateur radio by us. The patch get real time data from Gpredict and connect the presence of satellite in our geographical position to the audio filters. The mapping between audio and data is linear, synchronous: after a check of the presence of the satellite in our station, the altitute controls the filter directly. The composition is not to be considered a recording, the on-line material is provided only as example. It is a real time generated sound scape interacting with a plane of reality we don’t see but strong in his reflection. This work borns from my personal experience during last past years in Movimento do Sem Satelites [SatelliteLess Movement in Portuguese], an international nomadic collective originally from Brazil. Throught satellite metaphor we share a narrative and we create temporary autonomy zones that looks at satellite as a contemporary material to manipulate and play with. The workshop Orbitando Satelites, at Laboral centro de Arte y Creación Industrial [Gijón, Spain] was a poetic, political and technical research workshop on satellites runed in may 2011 where this sound track was made. During the workshop organized by Pedro Solar and animated by many artist and activists with different skills we set up a space for collaboration where investigating satellite science and philosophy. Orbitando satélites proposed an exercise on the visibilisation of these objects which hold a great and hidden influence on our daily lives in spite of being concealed from the human eye. 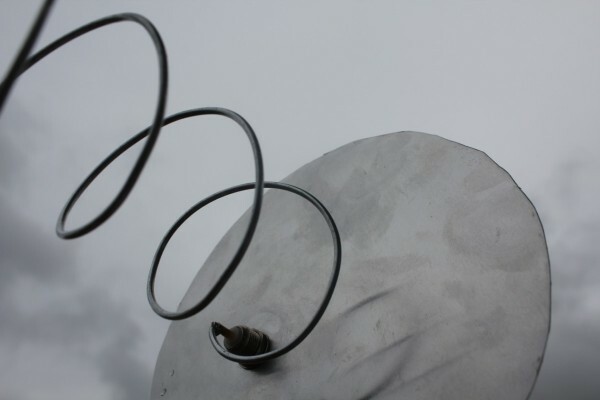 Research was conducted on how they operate, gaining access to their signals by fabricating antennae and using radio systems; showing how to locate and observe them through the use of free software. Following the tradition of independent communities involved in the creation of Free Information infrastructures, the meeting brought together experts and amateurs from different countries and cultures to draw up a declaration that poetically sketches a map of the possible uses of satellite-technology based systems.